fun online history learning game. "Ages of History Puzzle" is a free online knowledge level game, about the 10 major eras from the List of time periods, with approximate starting and ending year. Drag and drop the time periods in the correct date. A short fun puzzle for desktop computers, laptops and tablets, which may be played in the web browser. The History Knowledge Board include 10 pictures of history periods to play with. What is the duration of historical ages? What is the historical order of ages? How long are the Middle Ages? Which are the most notable ages? How to play Ages of History Puzzle. time pyramid to the right of the screen. Know at least 7 ages of history. Class subject: Ages of history and time period durations. 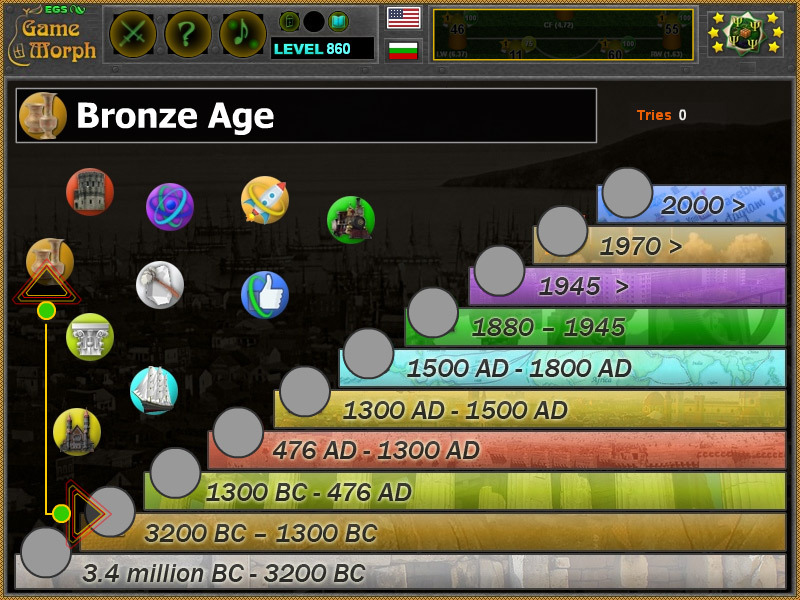 This fun puzzle game include 10 of the most notable time periods in human history. It may be used as interactive reference to the ages, or exciting exercise in history classes.